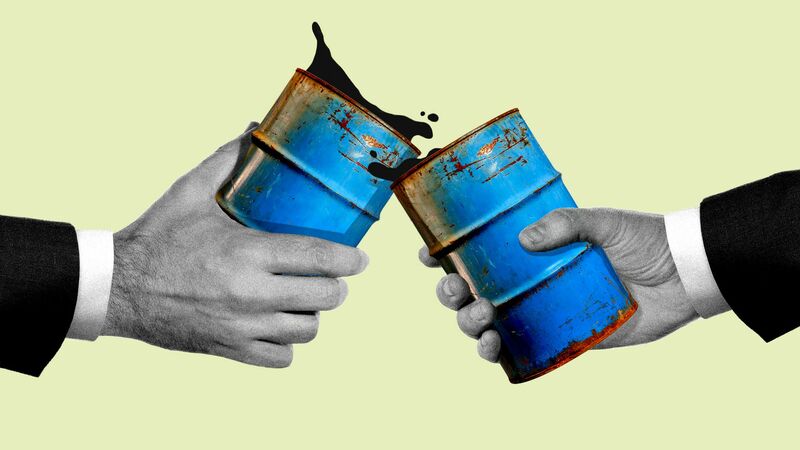 Falling oil prices are bad news for the oil industry — but they're great news for corporations that could use the relief from other expenses. Why it matters: With a tight labor market that's forcing companies to pay more to attract workers, plus the costs of tariffs from President Trump's trade war, oil is one less expense that will cut into companies' profits. "The oil price decline offsets other cost pressures that businesses have," Conrad DeQuadros, an economist at RDQ Economics, told Axios. The one exception: the energy sector, which banks on higher oil prices. Driving the news: U.S. crude oil is recovering slightly after a record 12 days of consecutive price declines, driven by fears of an oversupply. U.S. crude prices fell as low as $55, while Brent crude, the global benchmark, dropped to $65 per barrel. In October, they'd been as high as $77 and $87 per barrel, respectively. Analysts at Bank of America dialed back expectations on Wednesday that prices could climb to $95 per barrel "after the most sizable oil price corrections in recent memory," according to a research note. The backstory: Companies are already being hit with a triple whammy: higher commodity costs (including oil), a trade war that's making materials more expensive, and rising interest rates. Now add one more: labor costs have jumped, thanks to wages rising at the fastest rate in nearly 10 years. Executives haven't been quiet about rising costs and the pressure they're putting on profit margins. Take Walmart, whose CFO, Brett Biggs, told analysts in October that the high fuel prices at the time — which played a role in pushing up transportations costs — were a "challenge" for the company this year. Procter & Gamble CFO Jon Moeller told analysts last month that rising prices for crude oil contributed to an expected $400 million commodity cost headwind, along with higher transportation costs. The company also upped prices on its products, citing the "magnitude of cost increases." Gasoline prices at the pump have plummeted alongside oil prices in recent weeks. That means companies can count on cheaper gas to push an already strong consumer to spend more. "That extra $5 people don't spend on gas, they will spend somewhere else. It's going to be a positive [for retailers] coming into the holiday season assuming oil prices stay low," Allen Questrom, who was the CEO of JCPenney in the early 2000s, a period of rising oil prices, told Axios. Yes, but: There's no indication that falling oil prices now are a signal that they'll stay low for a long time — or that there will be a significant downturn like we saw between 2014 and 2015. Jeff Currie, a commodities analyst at Goldman Sachs, told CNBC the oil market sell-off was overblown. He said prices will rebound when OPEC, a group of key oil-producing countries, and allied producers including Russia, talk about a supply cut at a meeting next month. The bottom line: Lower oil prices have arrived at the right time for companies dealing with a potentially escalating trade war and the tightest labor market we've seen in decades.